This tour will take you to visit and explore the mysterious and attractive historical Silk Route in ancient China, where you will visit many historical wonders, ruins of ancient city and pass, and experience the Muslim culture and the beauty of the desert, Gobi, snow mountains and mysterious lakes in West China. The Silk Road is one of the most worth visiting places in the world. The Silk Road passes through Shaanxi, Gansu, Qinghai Provinces, Ningxia Hui and Xinjiang Uygur autonomous regions in China and then stretches over the Pamirs, further extend to Central and West Asia and finally gets to the east bank of the Mediterranean Sea and Eastern Europe. The total length of the Silk Road is over 7000km, over half of which is in China. There are numerous scenic spots and historical sites along the silk road in China: Jiayuguan Pass, the Mogao Grottoes of Dunhuang, Yangguan Pass, the Turpan Basin, Bazaar of Urumqi, Abakh Khoja Tomb, Idgar Mosque, Kashgar Old Town of Kashgar (Kashi) and many more. In this remote area, tourists can find many interesting and unique issues – includes Mogao Grottoes – the world-famous art treasury with invaluable murals and sculptures made between the 4th and the 14th centuries. * Visit the largest and richest Buddhist treasure trove in the world - the Mogao Grottoes which is with invaluable murals and sculptures made between the 4th and the 14th centuries and have been in use for the longest time in the world. * Step onto the west end of Great Wall – Jiayuguan Pass! Your private driver and guide will be ready for you at the airport or railway station when you arrive in Urumuqi. Sit back in a comfortable, non-smoking car, leave the hassles to your guide, and enjoy a trouble-free transfer to your hotel in central Urumuqi. After breakfast in the hotel, drive for Turpan for around 200km / 3 hours one way. On the way, you will pass the biggest Wind Power Base in Asia, Dabanchen Wind Power Plant and the Dead Sea in China, Salt Lake. 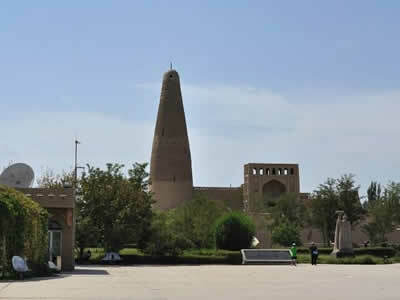 Today in Turfan, you will visit: Flaming Mountain, Suleiman Minaret (also known as Sugong Tower or Emin Minaret), Karez Well, Grape Valley, Jiaohe Ancient City Ruin and Uighur Village. Afterwards, get back to Urumuqi. In the morning, drive for around 2.5 hours to the Heavenly Pool, a lake on top of Mt. Tianshan (Heavenly Mountain and the UNESCO World Heritage). Taking boat to cruise in the lake. The blue lake water is finely contrasted with steep forested hills, high meadows and snowy Heavenly Mountain peaks behind. There you can walk, take electric carts, cable cars and a boat cruise on the lake. Afterwards drive back to Urumuqi. If time permits, you will also visit the Erdaoqiao Grand Bazaar in Urumuqi. At night, take overnight Sleep train from Urumuqi to Liuyuan (the railway station near Dunhuang). You will be met by your local guide and driver at the railway station at Liuyuan and drive for around 130km / 2.5 hours from the Liuyuan Railway Station to Dunhuang City. Today, you will visit: Mogao Grottos, Crescent Lake and Echo Sand Hill. After breakfast, drive for around 380km / 4.5 hours to the West Terminal of the Great Wall - Jiayuguan Pass. Transfer service to the Airport or Railway Station in Jiayuguan City. Your guide will look after you until your safety at the correct airport check-in desk or railway station check-in channel to complete your amazing tour. Say goodbye to your guide and the Silk Road.